There is no escaping the contribution the Higgins family has made to Soddy-Daisy athletics. 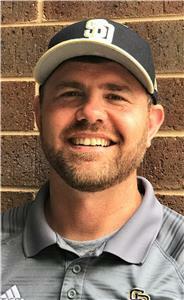 The baseball field is named after the late Tom Higgins and now his son, Jim, is taking over the Trojans’ baseball program, succeeding Jared Hensley, who in the past year has become the school’s assistant principal, in addition to his duties as athletic director after 10 years and 200-plus wins as baseball coach. Jim Higgins, for the past six years the Trojans’ head wrestling coach, on Tuesday was officially named baseball coach and his first assignment is to oversee tryouts coming up May 29-30 from 5 p.m. to 8 p.m. each day. Higgins, 38, is leaving his position as head wrestling coach and Brad Laxton will take over the program. Higgins said he will continue his association with wrestling, but not as a paid assistant. He also pointed out that veteran wrestling assistant Ashley Brooks is retiring. “My two sons are growing up in the wrestling program and I’ve been tied to it for 30 years,” Higgins said. “That won’t change. Wrestling is why the Higgins family came to Soddy-Daisy. My parents picked up everything we had and moved here because of the respect they had for Steve Henry (now the high school principal). In his final season as baseball coach, Hensley led the Trojans to a 20-14 record. The Trojans’ season ended when Walker Valley won the best-of-three semifinal series two games to one in the District 5-3A tournament at Bradley Central. When Hensley was promoted to assistant principal in December, speculation began immediately inside the athletic department about who would fill the position Hensley was leaving. In late March and early April, Higgins said the “ball was in my court” and he decided to take the baseball reins. “Baseball was always my primary choice,” Higgins said. “I’ve had a couple of years coaching baseball and enjoyed every bit of it. I always had the most fun with baseball and I aspired having my dad watch me play on television with the Atlanta Braves. Higgins attended Soddy-Daisy and graduated in 1998. He played baseball, football and wrestled before leaving for Cleveland State to play baseball for two years. He transferred to Carson-Newman, playing baseball for two years at the Jefferson City university. Higgins finished his initial degree and obtained his teaching license at the University of Tennessee at Chattanooga. Higgins was hired at Soddy-Daisy Middle School as an inclusion teacher and was an assistant on Henry’s high school wrestling staff. A year later, he was promoted to the high school when Henry was named assistant principal and became the Trojans’ head wrestling coach.